By Our Holy Mother’s Grace, the Summer Seminar of Tamil Nadu will be conducted on the 20th, 21st and 22nd May 2011 at Shri Venkateswara Tirumana Mandapam, 1075 / 3 Yercaud Main Road, Kondappanaickenpatty, Salem, Tamil Nadu, PIN – 636 008 (located at the foot hills of Yercaud). As usual this will be an intense workshop aimed at helping the Sahaja Yogis to go deeper in Sahaj. Yercaud, situated at an altitude of 1515 metres (4970 feet) above sea level is known for Coffee Plantations and Orange Groves. The lofty hills of extraordinary scenic beauty are endowed with a salubrious climate. The temperature never rises above 29 °C or goes below 13 °C. This quiet little hill station on the Shevaroy hills of the Eastern Ghats is the only one of its kind in Northern Tamil Nadu. Coffee and citrus fruits, most notably oranges, are grown in abundance apart from bananas, pears and jack. Scenically, Yercaud is quite enchanting and picturesque. The town's name is derived from the lake located at its center - in Tamil Yeri means lake and Kaadu means forest. It is also explained as Seven Forest. Another version, says it as Beautiful Forest. Separate rooms / halls will be provided for ladies and gents for their stay during the seminar. A maximum of 200 participants only can be accommodated in this place. Hence we request you to please intimate your participation as early as possible. Participants are advised to bring their beddings, toiletries, medicines etc. The Seminar is scheduled to start on 20th May by 09.30am and conclude by 4.30pm on 22nd May 2011. The programme will consist of Early Morning Meditation, Talks on Topics relating to Vertical Growth, Introspection on Shri Mataji’s messages, Havan, Puja etc. In the evenings there will be group games and cultural programmes. The programme will be in English. However efforts will be made to give a brief translation in Tamil, of the proceedings. We extend a warm welcome to all our Sahaja Yogi brothers and sisters. We request you to please give publicity for this programme amongst your members and encourage maximum participation. Kindly register immediately by paying the registration amount and get a confirmation on your registration from the undersigned. There will be no spot registration at the venue. A major highlight of this programme is that Shri Nalgirkar and other Sahaja Yogis from Delhi will be coming to conduct the sessions and share their experiences and guide us. Charges for the Seminar are as under. * For registering 4 members from the same family for 3 days, a discount of Rs.200/- per head will be allowed. These charges take care of the accommodation and food arrangements from 20th morning till evening on 22nd May 2011. Participation will be restricted to a maximum of 200, strictly on a first come first served basis. The payments may be made by DD in the name of H H Shri Mataji Nirmal Devi Sahaja Yoga Trust (Chennai) or directly into the Account No. 082010100206099 with AXIS Bank Ltd., Shastri Nagar, Chennai. Reaching the Seminar Venue :- There are trains to Salem. From the Salem Junction Railway Station take an Auto Rickshaw to the old town bus stand. From there Bus Numbers 3 and 56 will take you to Yercaud Adivaram (distance about 12km). From there the venue is just about 200 meters away. A tentative programme is attached. 14.30 – 16.30 Session II How to go into meditation and Nirvichar Samadhi. Shri Adi Shakti’s powers on Nadis and Chakras. 11.15 – 13.15 Session VI – How to exchange vibrations. the conducting of meditation sessions , giving more attention to the connection with shri Mataji, from the heart with love was wonderful and the need of the hour. 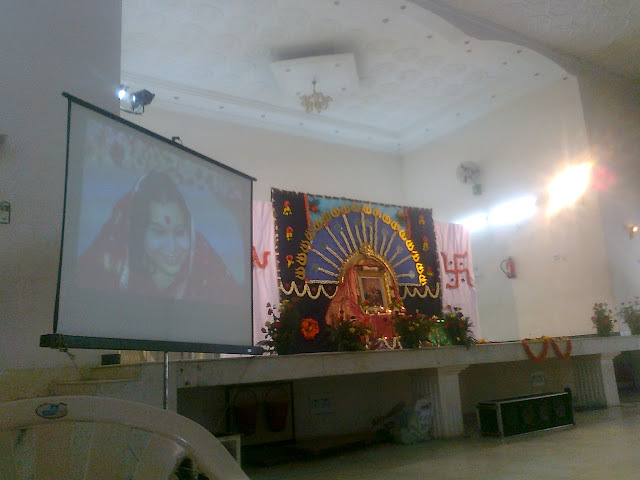 the seminar made to understand the fact that "sahaja yoga and the techniques"are to understand at least few of the different aspect of the Goddess and to be with her rather than believing in the techniques as the sole saviour. again i express my love for you, all the collective. Let us pray for Her Grace to have more such seminars. Everyone enjoyed the seminar tremendously and were very eager to attend the next seminar. In fact I got a couple of calls from some of those who could not attend the seminar asking when and where the next seminar will be. 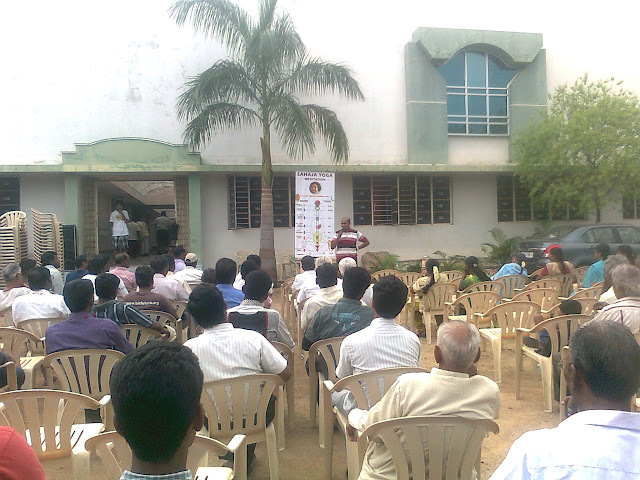 Have told them about the prog at Tirupathi. Heartiest thnaks to Shri Mataji, the program went off well. my feedback on Yercaud Experience. I was able to experience being one with Shri Mother in meditation continuously through out the meditation session. Thank you Shri Mataji, for giving us this beautiful, unfolding experience. I wish and pray that All Sahaja Yogis should experience and enjoy this state of meditation just to become beautiful instruments of Shri Mataji. I wish that every Yogi should try to attend this kind of workshops that are happening now across India. I still carry in my heart the beautiful moments of surrendering and love to Mother, the joy of collectivity and the bliss of being one with Shri Mataji. Thank you to our Beloved Mother and all the sahaj family for organising this workshop and making me be part of it. Neverending joy!!! It'll be a blessing for me to participate again and again,to enjoy the blissful state of being all ONE at Mother's Lotus Feet. before eating and gradually this behavior was learnt by other monkeys. automatically spreads to the rest of the population. human population and request our beloved Mother to help us solve them. no other option left but to call for Divine help. our meditations and express our humble desires. Welcome to the land of looms and lore’s. By our Holy Mothers Grace Kerala state seminar will be conducted on 7th 8th of may 2011 at Govt. Town Girls Higher secondary School, Thalassery, Kannur District, Kerala State. The seminar will make us feel the divine love grace and compassion of our Divine Mother on our subtle system. Every moment we feel the divine miracle, specially the blissful experience of collective Dhyan, the rarest divine connection the Ekakrihta with the all mighty Holy Mother. Shri Nalgirakerji and other SahajaYogies from Delhi will be coming to conduct the session and share this Divine Experience to us. We shall all pray to our Holy Mother to guide us on the below mentioned aspects. Shri Mataji’s photograph is enlightened with all pervading powers which flows from our Mother’s great photograph and works on our spiritual physical and emotional sides. We can feel it collectively. How effortlessly Shri Mataji’s powers take us into Meditation. Shri Mataji’s Param Chaitanya, which shows in Nirakar form, takes us effortlessly in to meditation and bliss of Nirvicharita. We will pray in collective and will experience unique divine experience on our entire subtle system. Shri Mataji is the source of divine love and compassion. When we pray from our heart to Mother, the most powerful mantra, the name of our Holy Mother works and cleanses all the chakras and nadis and we get the blissful experience by the grace of Shri Mataji. 09.30 – 11.00 Session I – Questions & Answers. Miraculously cures all our problems. Shri Mataji grants us Nirvichar state. 12.45 – 13.15 How Powerfully our connection gets established with Mother and then her powers starts flowing in every aspect of our life. 14.30 – 16.00 Session III – How effortlessly Shri Mataji’s powers takes us into Meditation. powers on Nadis and Chakras. 11.00 – 12.30 Session VI – How to exchange vibrations. The program will be conducted with the collective participation of all the sisters and brothers and will be inter spread with Audio/Videos of Shri Mataji and collective Bhajans in the praise and glory of our Holy Mother. 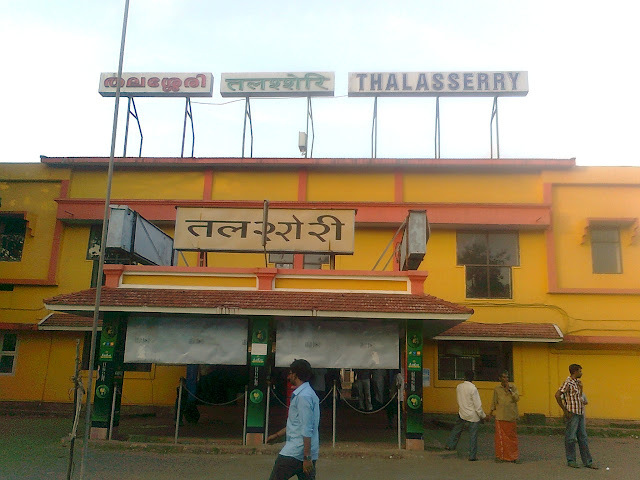 There is hardly 1km from Thalassery Railway Station and Bus stand to the venue. Nearest Airport in Calicut and it is in 100km from the venue. 1. A Sahajyoga workshop on Meditation was conducted in Thallassery town of north Malabar of Kerala on 7 and 8 May 2011. The main emphasis was how powerful our Holy Mother’s name is and how it can give us the experience of all aspects of sahaja yoga meditation. 2. Sahaji’s from Kerla, Tamilnadu and Delhi had conducted this workshop and it was attended by about 600 beautiful children of Shri Mataji who were seeking only Mother. The Workshop was conducted in the Government Matriculation School near MG Road about a Kilometer from the Thallassery Railway Station. 3. The altar of Shri Mataji was decorated with fragrant jasmine and rose and bunches of other beautiful flowers. 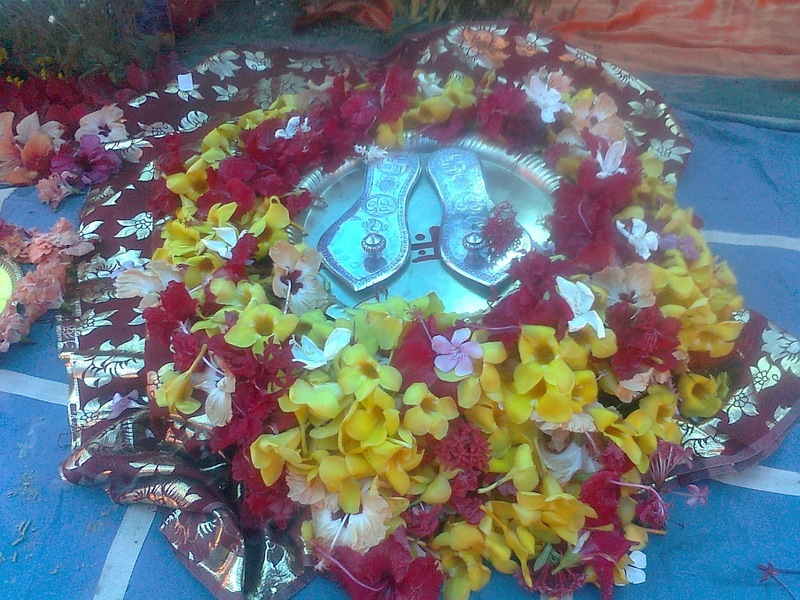 The Cermonial Red umbrella with golden trinkets stood above the photograph of the Mother as a mark of honour for Param Pujya Mataji Shri Nirmala Devi. The roof of the shamiana near the altar had bunches of yellow ‘konna’ (amaltash) and tender papal leaves alternating. Both of these are considered auspicious in this part of the country. b. How to get into effortless Meditation. d. How to clear the chakras and nadis by using only the way Shri Mataji has taught us. e. That bliss only starts when no one and nothing (our thoughts, any so called personality of a yogi and our emotions for any other yogi as a teacher/preacher) is there between the seeker and the Ekakarita with our Holy Mother. 5. It was reinforced that on our own we cannot clear or Meditate, but it is granted simply by the almighty Mother by our desire and prayers to Shri Mataji. 6. Feed back of the participants indicated that they had experienced thoughtlessness in this measure for the first time effortlessly by simply praying from the heart. 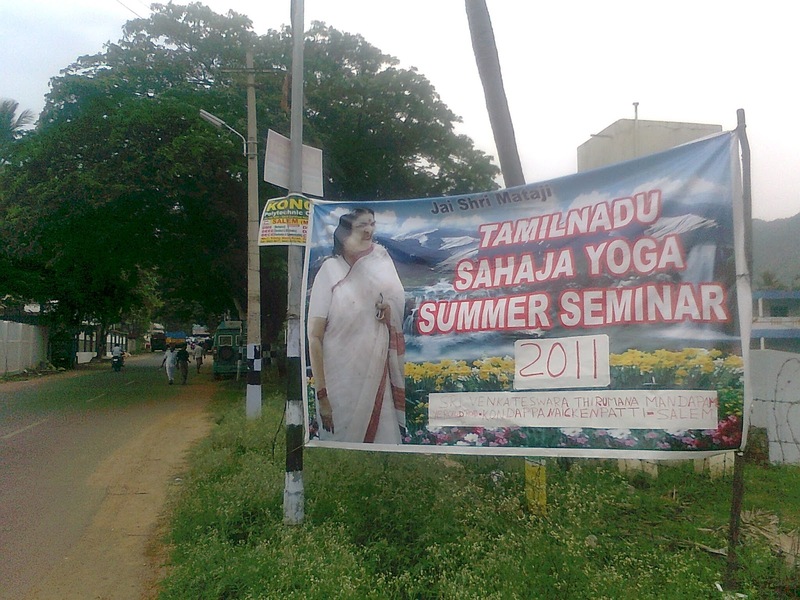 Some of them were practicing Sahajyoga for more than a decade and not getting the bliss of divine connection strongly and continuously. And the wonderful experience everyone felt when they surrendered all their problems of their life at the lotus feet of Shri Mataji resulted in total silence and peace within them. And all the pressures and fear of the problems vanished from their system. 7. The basic simple nature of the people was visible in the ease which they took to meditation, unmindful of missing the tea breaks. They themselves expressed surprise that they could sit for virtually the whole day on both the days. 8. On 08 May 11, in the post lunch session the workshop culminated with a vibrant Sahastrar pooja with the representatives for the pooja including yogis from Chennai and Nellore. 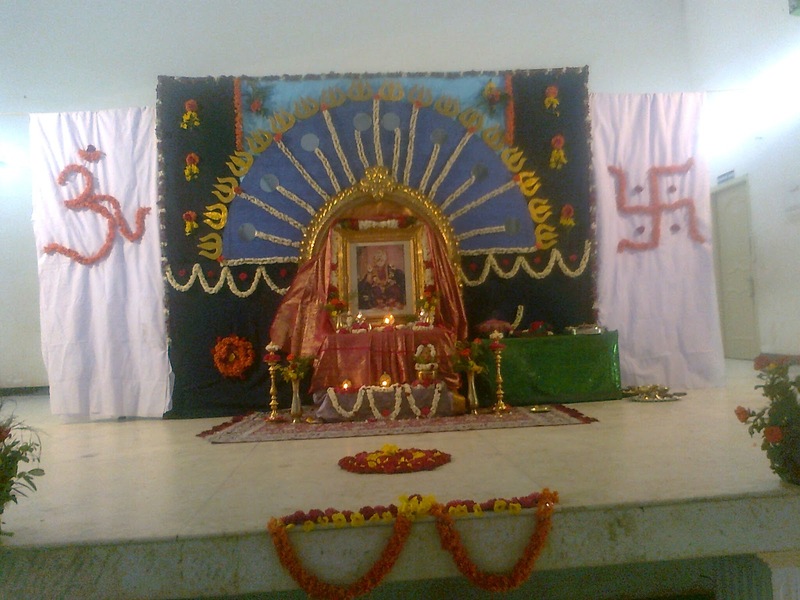 Songs like Aaj hai aaj hai poojan shri maa ka rendered by local yuva and a Malayalam bhajan set in tradiditional bhajan tune, saying that it is essential for every Sahajayogi to see the Divine face of Shri Mataji on waking up every morning brought a feeling of intense bhakti. 9. Thallassery means ‘head ok’. No other name would have been more appropriate as one enjoyed the Sahastrar pooja amidst the simple folks of the small town driven by their intense desire for Meditation. 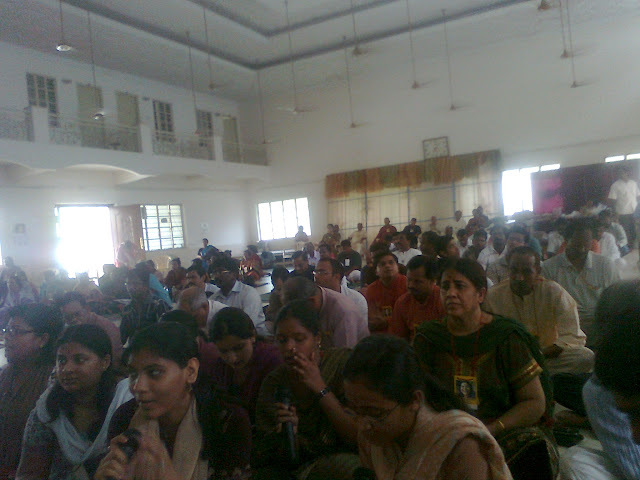 I want to share my experiences about Workshops which i was fortunate to attend at both Chennai And Thalaserry. First of all i want to thank from bottom of my heart to SriMother and to you brothers to come all the way and meditate with us. I want to write my experience on the day when i attended Chennai workshop but i could not do that at that time. 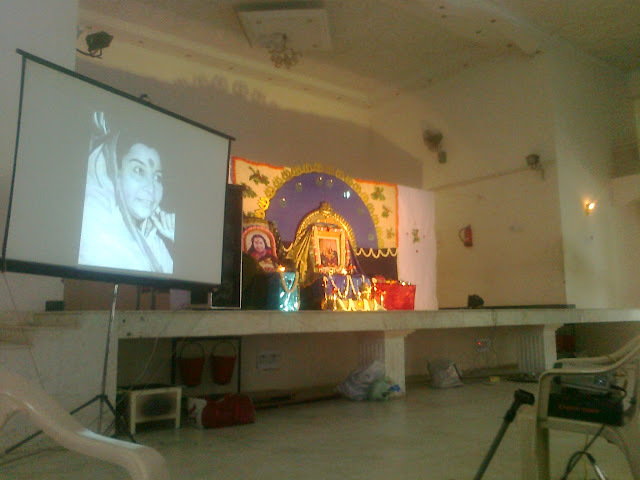 The Only thing we did in seminar is meditating on SriMataji ,and also it was proved that in each and every single minute in the seminar that whenever an heart-full desire reaches mother it comes back as greater showers of love from Her.This experience of proof has brought me closer to SriMataji a lot. I could say that the impact of the workshop was not only for those two days but its there till this moment i am writing this email and it continues. I could easily say the workshop has changed me lot that i could put SriMataji before every thing not only in meditation but in each and every moment of life. I could feel SriMataji with us in day to day life and all aspects of life because after attending the workshop we could easily understood that there is nothing important,nothing beautiful than being with SriMother all the time. Whenever i am having problem subtly i started praying to mother that please take over And it worked beautifully on me,that i am spending quality time with mother rather than wasting on mundane things.This was the point which is emphasized in the seminar. This is an Overwhelming desire of me that i could attend the same workshop again and again to get closer and closer to SriMother's Love. I am extremely fortunate to attend Workshop at Thalaserry. 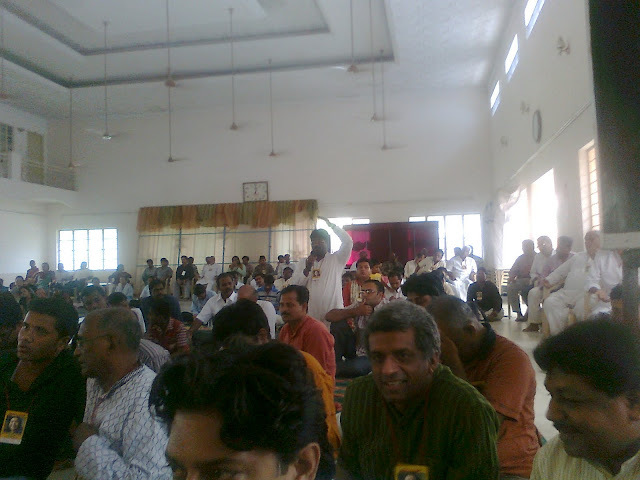 My Experience During And After attending workshop at Thalaserry. The ambiance where Kerala sahaja yogis have decorated mother is so loving and wonderful.It was like seeing our Holy Mother sitting in between LOVE and blessing us.The only thing i felt at workshop is that the moments which we are spending at Mothers Lotus feet should stop and enjoy the state at her Lotus Feet.I haven't felt like coming out from that state,which all the other yogis also felt the same. I could only say that the thirst to be with mother has increased so much after the workshops and i thank to Mother and to you brothers for the same. Thanks for bearing with me through out this Email. We Collectivity of Chennai are waiting to meet Mother so deeply in the coming Workshop at Yercaud.And we welcome you from our hearts to collectively worship Mother and get drenched in her LOVE. 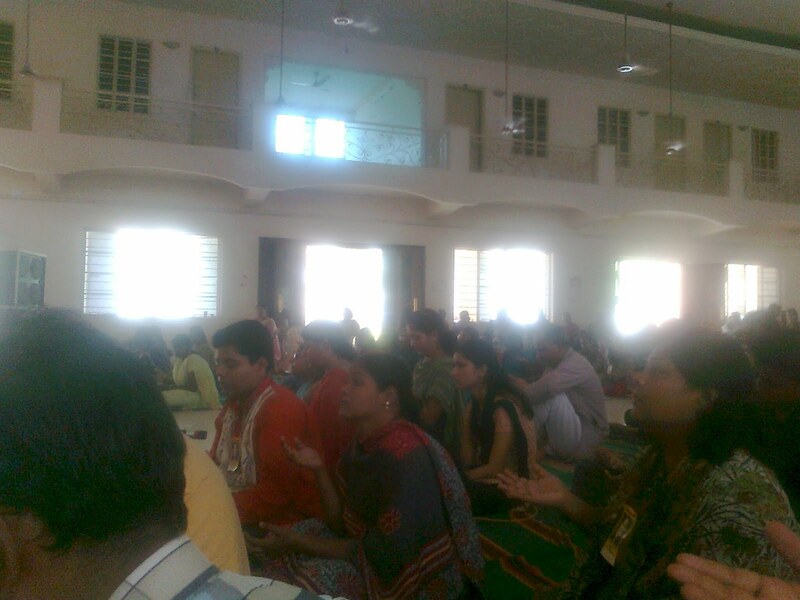 By the grace of SHRI MATAJI We had the sahajayoga workshop on april 7 and 8 in kerala , Thalassery . sahajis from delhi , tamilnadu and andhra came . 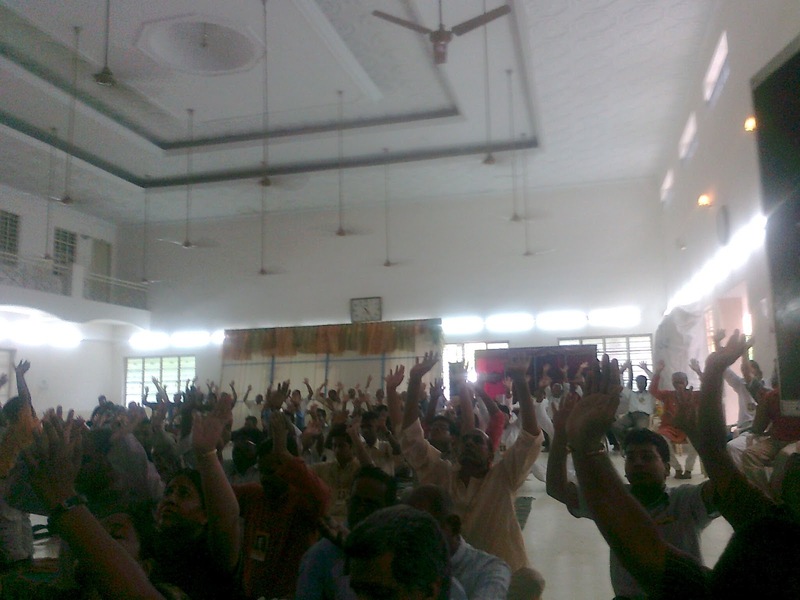 delhi sahaja brothers conducted the meditation . 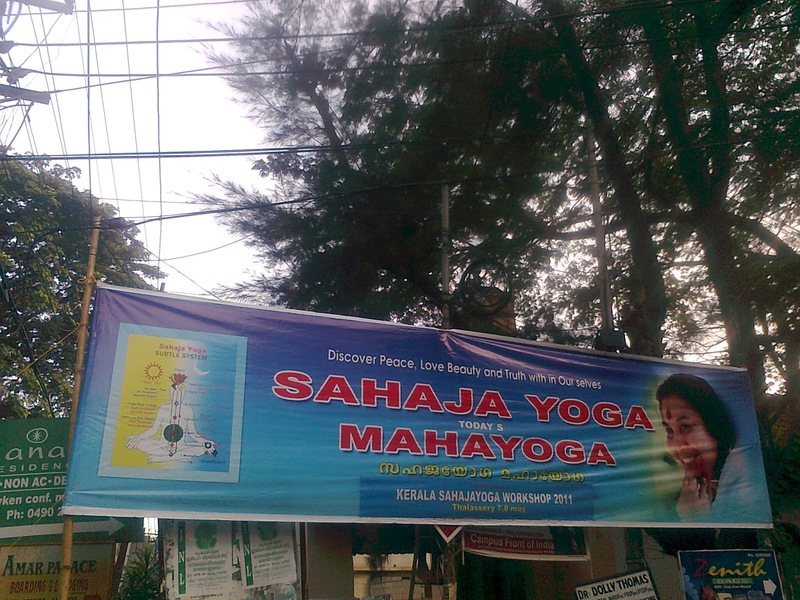 It was such a wonderful and great experience for all the yogis of kerala . we all were taken to such height of meditation using the great mantra "SHRI MATAJI" . Also the importance of MOTHERs photograph were taught by the yogis , that it was not only a photo but our MOTHER itself . Thanks for all the brothers and sisters who came from delhi . we too enjoyed the bhajans and had the sahastrara puja with all our brothers and sisters of delhi. And the most important thing is now while we meet all the yogis who participated in the workshop , says that we reach into nirvicharita soo simply as per the meditations conducted by delhi brothers , we all are very thankful to you all . Look forward for all of you again in kerala . Thank you for taking us to such a great experience . MANY MANY Thanks to SHRI MATAJI . MANY MANY thanks to all brothers and sisters. JAI SHRI MATAJI to ALL of you .